I have to be honest, there are too many great restaurants in Dallas to narrow it down to 10. However, as the biggest foodie I know, the fact that I have grown up in Dallas and eaten at almost ever restaurant, and knowing that y'all will probably want help with picking your Valentine's Day restaurant, then I hope y'all will find this list useful. 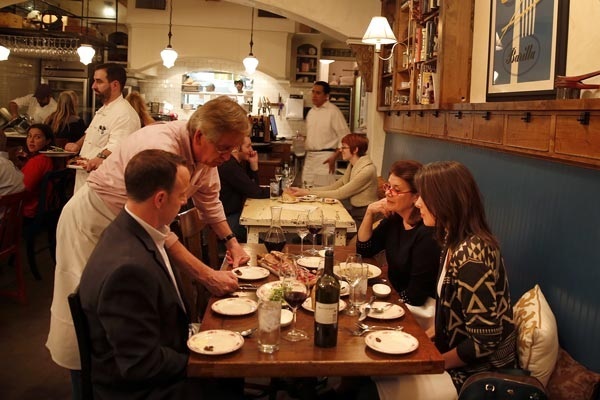 A much-loved neighborhood stalwart, dating back to 1977, oozes old-fashioned glamour with its dimly-lit Victorian decor, intimate little nooks and a menu that shines with comforting, Francophile classics. Expect old school bistro-style dishes to cover everything from escargots to beef tartar, lobster thermidor and roasted duck. Not to be missed is the champagne brie soup, it's legendary. Equally impressive is a wine list that includes over 150 bottles from around the globe, many of which are priced at less than $50. There's also an extensive selection available by the glass too. End with one of the souffles, they never fail to impress. This quaint wine bistro opened in 1972 as one of Dallas’ first restaurants to serve wine by the glass. The Grape prides itself on its simple yet delicious menu, which is updated monthly to accommodate seasonal and local selections. The small, New York City-style space enhances the romantic vibe, and you can choose to sit inside or outside. Come on a Wednesday to enjoy one-third off any full bottle of wine. The Grape also serves Texas Monthly’s Best Burger in Texas, historically served on Sunday brunch but now offered most days. This and Hattie’s are the best 2 romantic brunch options in town. If you are an adventurous eater then this is the place for you. This has long been a favorite of mine. Matt McCallister uses only the freshest ingredients at this farm to table restaurant. The proven way of what to eat at this dynamic restaurant is to pick your protein and then let the kitchen do the rest. I have eaten so many great things that I ordinarily despise like beats. My personal favorite French restaurant in Dallas, sorry St Martins. It’s very romantic with a French Bistro flair; flickering candles, oysters and champagne – you’ll get that all here and more! We love the French onion soup, Poached Egg Farm salad, Mussels, and Beef Bourguignon Pappardelle. They also have a fantastic beverage list featuring over 120 of American and French wines, along with wonderful cocktails and craft beer. This Subterranean seafood & steakhouse with a garden waterfall view has a story almost as unique as it’s décor. Yes Dallas has many great steakhouses, but when it comes to ambiance then Dakota’s takes the cake. If it is a nice night then make sure to request to be seated on the patio. With limited seating, handmade pastas, and home-cured meats then what is not to love? Ever since day 1 this has been a force to be reckoned with. No Italian restaurant in Dallas has quit the reputation and exclusivity of Lucia. So, if you want Italian for Valentine’s Day and you would like to be seated in a quaint dining room with sophisticated cuisine then this is it. Here is a great choice for those who cannot decide between steak and lobster. With the first class drink menu, all-around extraordinary cuisine, upscale yet classic décor, and piano player then you are bound to have a fantastic night. This is it if you want to feel like you are sitting in the Champs-Elysees at a corner bistro. With the classic fair and great hospitality then you are bound for a romantic Valentine’s Day evening. Another classic on Greenville Avenue, with great food, ambience and live music. The Terilli family has definitely earned a much deserved reputation with this classic. Some may say that this is the best Italian in town, but that is up for you to decide. One thing that is true is Lucia and Terilli’s are both great and serve to a different atmosphere. If you want to feel like you are in a Manhattan Italian restaurant with jazz in the background then come here for a fantastic night. Experience refined southern home cooking at Hattie’s in the Bishop Arts. Hattie’s presents new approaches to old favorites, such as Low Country shrimp and grits, mac ‘n’ cheese-crusted filet of beef, and bacon-wrapped meatloaf. Hattie’s clean, mostly black and white decor centers all the attention on the food. After dinner, take a romantic walk around the rest of the Bishop Arts District, where you’re sure to discover something else to check out and maybe even some pie to get at Emporium Pies. This is also another fantastic brunch option, with their famous off-the-menu Chicken & Waffle. Once again, there are many other fantastic restaurants around town, but these just happen to be my romantic favorites.